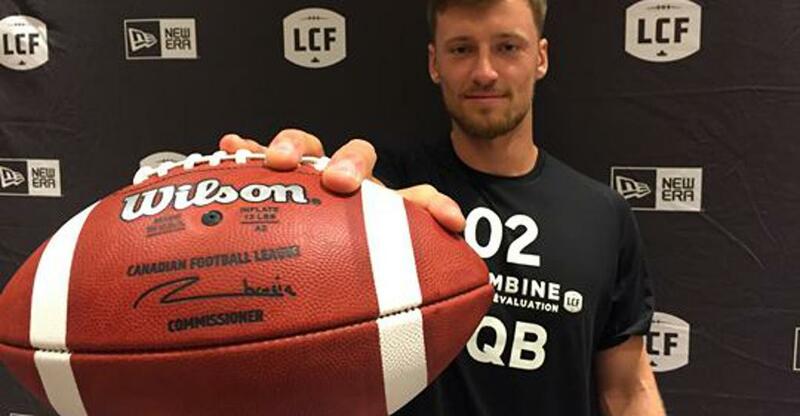 TORONTO — Michael O’Connor is hoping CFL teams will look beyond his birth certificate and the stigma it may bring and give him a shot at playing quarterback. Nicknamed Wacky, O’Connor certainly has the credentials on his resume and the intangibles to go with them – he’s 6-foot-4, he’s got off-the-charts football smarts and the former NCAA Division 1 recruit has a great arm. Oh yeah, but he’s Canadian. In 2018 with the University of British Columbia Thunderbirds, he completed 222 of 316 pass attempts for 2,701 yards and 14 touchdowns, with just four interceptions. In 2015, he led the team to a national championship and was named the Vanier Cup MVP. While the nine CFL teams will closely be watching again Sunday at the Combine, O’Connor will also have a Pro Day April 4, with a couple of NFL teams confirming they’ll be there. There was plenty of buzz about O’Connor even as he played for Ashbury College in Ottawa. After starting to play football at age seven with the Orléans Bengals and getting international exposure while with Victor Tedondo’s Gridiron Academy, O’Connor left for Baylor School in Tennessee at age 16, then spent time at the IMG Academy in Florida before (ranked as ESPN’s third-best pocket passer and with 13 NCAA offers) committing to play at Penn State in 2014. That was an eye-opener as he fell behind Christian Hackenberg and Trace McSorley on the quarterback depth chart, then made a decision to leave his scholarship behind and return to Canada – with UBC. “That was a whirlwind,” said O’Connor. “Three different states, three different years. I never really had a chance to sit back and enjoy everything. I’m more comfortable being myself, being in my own skin. I know who I am, I think it’s really important to know yourself. That’s big at the next level, knowing who you are and what makes you tick. So why, with interest from other NCAA schools and scholarship money, decide to return to Canada and UBC? His mission this weekend: Let teams get a closer look at both who he is on and off the football field. “I want to sit down the teams and let them get to know me, my personality and what makes me tick,” said O’Connor. “I want to show them my dedication to the game. It’s a big selling point. I’d say I’m very intelligent, I love to study the game of football, I love to watch film, I love to break down defences, I love drawing plays – that’s something I want to get across to teams, the passion I have for the game.